The world is facing an increase in the frequency and severity of natural disaster events. Events which, when they strike, threaten the social, environmental and financial foundations of communities. And while these events cannot be prevented, their impacts can be limited. One strategy to meet these challenges is to leverage resources at hand, adopting the ‘create once, use many times’ viewpoint. It is in this line of thinking that this research project has emerged. National land administration systems are well-established in many countries, housing land, geospatial information and sophisticated data management systems including SDIs. These resources already facilitate disaster risk management practices, however wider application and incorporation of this information for improved disaster resilience has not yet been explored. Investigating and understanding this issue at a variety of contexts is the first step. The current 2017-2018 research project on land resilience funded by the World Bank is taking on these issues, exploring at the national and local level a number of countries with the aim to deliver countrylevel detailed action plans for 5 of these countries. The project is framed around the two key points: firstly, that disasters impact not only the economy of a country, but also the citizens through their most valuable asset – their land and property, and secondly, that national land administration information and SDI are fundamental for effective implementation of disaster risk management. This project explores these ideas and develops a method that adopts a case study approach to explore the national land and geospatial systems and disaster risk management processes of a number of countries, and generates country specific action plans to improve resilience. There is wide recognition that national land administration systems and spatial data infrastructure are fundamental for disaster risk management. They play a key role in facilitating pre and post disaster tenure, land use, land valuation and zoning information in a unified geospatial platform for planning, monitoring and implementing responses. The input of this information enhances resilience capabilities and enables stakeholders to carry out the required mitigation and preparedness actions. Better access to information, along with more secure tenure, will yield land use and management decisions that take resilience into account and reduce vulnerability. The extent of the role that land and geospatial information, the function and responsibility of the institutions that govern the data, and the resulting impact that this data has on the overall resilience of society has not been extensively explored or clearly defined to date. This leaves a critical gap in knowledge regarding potential to significantly improve disaster resilience for stakeholders, particularly at the community level, using existing information and resources. As a society, we are still trying to understand the concept of resilience and how it can be successfully established and implemented for stakeholders in our communities, taking into consideration the different priorities and needs of individuals. Land administration and the vast wealth of data that it captures is a key component that requires further study and consideration within the contexts of disaster risk management and disaster resilience. There is scope for national land and geospatial systems to play a larger role and create a bigger impact. Disaster do not discriminate based on any jurisdictional, economic, or social borders, and thus the impact of such events is often spread far and wide, directly and indirectly. Combatting the impacts of these events is complex and requires thorough understanding of the hazards and the potential risks they pose, comprehensive disaster management practices, multi-disciplinary and crosssectoral consideration and analysis, and most importantly – strong disaster resilience across all communities. Developing resilience to disasters is key, but often a complex endeavour. As a society, we are still trying to understand disaster resilience and how it can be established, successfully implemented, and sustained – for a range of communities, with varying contexts, with different priorities and needs. In this mammoth task, input is required from all levels of society: top down from institutions and governments, bottom up from individual citizens and communities at the local level, and from national and global organizations spanning all sectors, industries and disciplines. National land and geospatial information are important components for input that have considerable value to add to the establishment of disaster resilience, however the role of this information, the function and responsibility of the institutions that govern the data, and the resulting impact that this data has on the overall resilience of society has not been clearly defined. Understanding the impact that national land and geospatial data has on disaster resilience requires examination of the literature across the wider areas of land administration, disaster risk management and disaster resilience. The intersection of these three key areas brings to light previous experiences and lessons learnt, and helps to define the role of the national land administration institutions themselves and the data they produce within the context of disaster risk management and disaster resilience. Globally, several key initiatives that aim to build resilience to disasters have emerged in recent years. Many tackle a broad range of issues, at a number of levels ranging from global or national down to local and community levels. In particular, the 2030 Agenda for Sustainable Development, the Hyogo Framework for Action, and the Sendai Framework for Disaster Risk Reduction outline key points relevant in the context of improving resilience to disasters and the impact that national land and geospatial systems can have. The 2030 Agenda for Sustainable Development outlines a need for new data acquisition and integration approaches, including supporting developing countries in strengthening the capacity of national data systems to ensure access to high quality, timely, reliable and disaggregated data (UN, 2015). This includes national land and geospatial information, and the application of this data to address the identified sustainable development goals (SDGs). The Hyogo Framework for Action underscores the need for, and identified ways of, building the resilience of nations and communities to disasters. Sustainable development, poverty reduction, good governance and disaster risk reduction are identified as mutually supportive objectives. It puts forward that in order to meet the challenges ahead, accelerated efforts to build the necessary capacities at the community and national levels to manage and reduce risk must be made (UNISDR, 2005). Further to this, within the Hyogo Framework for Action, land issues have been established as one of the key priorities for the period of 2005-2015, and have been gaining momentum within the disaster risk management community in recent years. The Sendai Framework for Disaster Risk Reduction follows on from the Hyogo Framework for Action and aims to substantially reduce the risk of disaster and losses in lives, livelihoods and health and in the economic, physical, social, cultural and environmental assets of people, businesses, communities and countries through the implementation of integrated and inclusive measures that prevent and reduce hazard exposure and vulnerability to disaster, increase preparedness for response and recovery, and thus strengthen resilience (GFDRR, 2012). The Framework has identified seven global targets which address areas such as global disaster mortality, number of people affected by disaster, direct disaster economic loss, damage to critical infrastructure and disruption to basic services, creation and implementation of disaster risk reduction strategies, international cooperation, and availability and access to multi-hazard early warning systems and disaster risk information and assessments. Disaster risk management has a focus on the preservation and protection of land and property and is centred on stakeholders to promote a bottom up approach for managing disaster risks. 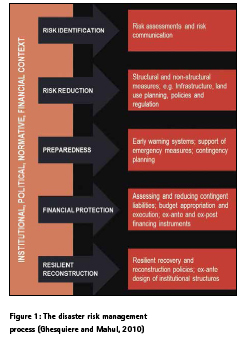 The comprehensive risk management framework focuses on five core areas: risk identification, risk reduction, emergency preparedness, financial resilience, and sustainable recovery and reconstruction, as illustrated in figure 1. This framework can be used to develop practical approaches to disaster risk management, and is based on the fundamental principle that citizens and governments must be empowered to make informed choices about their risks and how best to reduce, retain or transfer them (GFDRR, 2012). In the last two decades, the discipline of land administration has undergone a major evolution. The role land administration plays within society has become more defined and understood and the link between appropriate land administration and sustainable development has been established, largely through continued efforts from the International Federation of Surveyors (FIG) (Enemark, 2005). One element which is now strongly aligned with land administration, and land planning, use and development is disaster risk management (FIG, 2006), however the specific role of land administration within this area has not been extensively explored, particularly integrating land administration systems in a country context with land risk management practices. Land administration foundations are based on risk management principles and focused on decreasing risk through secure tenure. Land administration information is fundamental in improving disaster risk management practices. Research has shown that the use of land and geospatial information for disaster and emergency management applications can improve operations and outcomes (Mansourian et al., 2004; Asante et al., 2007). Exposure information, which is derived from land and geospatial information is a key component and comprises information on people, buildings, infrastructure (transport, energy, communications and water), businesses, hazardous substances, primary and major industries (Nadimpalli et al., 2017). The argument which supports the use of land administration information in the process of disaster risk management is not complicated. The combination of hazard information with relevant information on land tenure, land value, and land use enables the necessary risk prevention and mitigation measures to be identified and assessed in relation to legal, economic, physical and social consequences (Enemark, 2009). Combined land and hazard information has been identified as a critical element in the mitigation of new disaster risk management developments (Emergency Management Australia, 2008). Hazard information presented using land administration information as a foundation can assist in making decision makers more aware of potential risks and more motivated to implement appropriate disaster risk management strategies (The World Bank, 2010). The ubiquitous nature of maps and other land and geospatial information today makes the interpretation of the visual information straightforward for the majority of stakeholders (Tate et al., 2010). The value in land administration data is that it enables the nature and extent of hazards to be visualized allowing the impacts of the hazards to be easily understood to informing disaster risk management strategies (National Emergency Management Committee, 2011; Tate et al., 2011). As some risk is relevant to specific areas, the land administration information can reveal vulnerabilities and exposure to certain hazards. Data regarding topography is particularly useful in its ability to reflect tsunami, storm tide, tropical cyclone, bushfire, and landslide risk (Middelmann, 2007). The better the knowledge base of information that is available for assessment of the risks, the more informed the disaster risk management assessment is likely to be (Schneider et al., 2009), and recent research in this area has highlighted the increasing role of spatial information in disaster risk management. In this domain, land and geospatial information are a cornerstone in pre and post disaster management of land by facilitating land tenue, land valuation and effective land use planning (Zevenbergen et al., 2014a,b). Secure rights and access to land are crucial for the vulnerable groups most affected by a disaster. Tenure security in the face of disaster enables housing reconstruction, food security and recovery of production systems (UN-HABITAT, 2010). Accurate and up-to-date land valuation supports insurance, compensation, property tax, compulsory purchase and strategic advice to governments in disaster recovery (Mitchell et al., 2014a,b). Further, effective land valuation and property taxation measures can support post-disaster emergency response, recovery and reconstruction activities. Flexible land use planning standards can facilitate reconstruction aimed at building back better and mitigating the risk of future disasters (UNHABITAT, 2010; Roy and Ferland, 2014). A key aim of this project is to develop a roadmap which demonstrates how national land and geospatial systems could improve resilience to disasters. This strategic roadmap in turn guides the development of the country action plan template, which when applied to a particular country context, can produce a country-specific action plan. 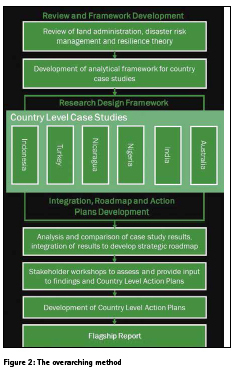 In order to develop the strategic roadmap, and ultimately the country action plans, the research is structured into the three key phases of: review and framework development, research design framework, and integration, roadmap and action plans development (see figure 2). The first phase informed the development of the country case study template. The template was organized into the 5 sections of: introduction, contextual analysis, land and geospatial information investigation, disaster risk management institutional and legislative framework, and challenges and lessons learnt. This template was utilized in the second phase of the research to investigate the role of land administration and geospatial information systems, and disaster risk management practices in each country, and the status of national land, geospatial and NSDI systems, and the countries disaster risk management practices for the selected case countries. To complete the template, input from stakeholders and industry representatives from the national land and geospatial organization and disaster risk management organization was required. In the third phase of the method the results of the case studies were examined, analysed, and inferences and comparisons were made. The results informed the development of the strategic roadmap and the initial development of the country action plan template. Figure 3 shows the process. At the current stage of the project, the strategic roadmap is complete and the country action plan template has been drafted with a series of local stakeholder workshops organized to take place to further enrich the data. The workshops will be repeated for several countries and will involve a broader range of stakeholders from the national and local levels to attain multi-dimensional perspectives. The discussion topics will include: drivers and barriers to integrating land and geospatial information into DRM practices, current use of geospatial data in DRM and other relevant areas, and ways to incorporate information into DRM practices. The outcomes of these workshops will complete the data collection and validation required, and the final countryspecific action plans will be produced. The overall findings from this project and the final country action plans will be reported in a World Bank published Flagship Report. This article is based on a World Bank project titled “Improving Resilience and Resilience Impact of National Land and Geospatial Systems” and was supported by the World Bank Social, Urban, Rural and Resilience Group. The authors acknowledge the support of project partners, United Nations Initiative on Global Geospatial Information Management (UN-GGIM), The Centre for SDIs and Land Administration (CSDILA) and the Centre for Disaster Management and Public Safety (CDMPS). This paper is based on the views of the authors and may not represent the view of the organizations. Enemark, S. (2005). A Cadastral Tale. WEEK ON GEOMATICS. Bogota, Columbia. Enemark, S. (2009). Sustainable Land Administration Infrastructures to support Natural Disaster Prevention and Management. UN Regional Cartographic Conference for the Americas. New York. GFDRR. (2012). The Sendai Report: Managing Disaster Risks for a Resilient Future. Ghesquiere, F., & Mahul, O. (2010). Financial Protection of the State against Natural Disasters: A Primer. International Federation of Surveyors (FIG) (2006). FIG Statement on the Cadastre, International Federation of Surveyors. Mansourian, A., Rajabifard, A., Valadan Zoej, M.J. and Williamson, I.P. (2004). Facilitating Disaster Management Using SDI. Journal of Geospatial Engineering Vol. 6 No. 1 pp. 1-14. Mitchell, D., et al., 2014a. Addressing land issues in disaster risk management in the Pacific Island Countries. Land Tenure Journal, Food and Agriculture Organization of the United Nations, 1, 105–135. Mitchell, D., Myers, M. and Grant, D., 2014b. Land valuation: a key tool for disaster risk management. Land Tenure Journal, Food and Agriculture Organisation of the United Nations., 1, 37–69. Nadimpalli, K., Mohanty, I., Vidyattama, Y., Kalantari, M., & Rajabifard, A. (2017). Australian Natural Hazards Exposure Information Framework. Rajabifard, A., Potts, K., Torhonen, M., Barra, A. F., Justiniano, I. (2018). Improving Resilience and Resilience Impact of National Land and Geospatial Systems, Annual World Bank Conference on Land and Poverty, Washington DC, USA. Tate, E., Burton, C.G., Berry, M., Emrich, C.T. and Cutter, S.L. (2011). Integrated Hazards Mapping Tool. Transaction in GIS.Vol. 15 No. 5 pp. 689-706. Tate, E., Cutter, S.L. and Berry, M. (2010). Integrated multihazard mapping. Environment and Planning B: Planning and Design.Vol. 37 pp. 646-663. UNISDR. (2005). Hyogo Framework for Action 2005-2015: Building the Resilience of Nations and Communities to Disasters. In World Conference on Disaster Reduction. Kobe, Hyogo, Japan. United Nations Human Settlements Programme (UN-HABITAT) (2010). Land and Natural Disasters: Guidance for Practitioners. Nairobi, Kenya, United Nations Human Settlements Programme (UN-HABITAT). United Nations. (2015). Transforming our world: the 2030 agenda for sustainable development. Zevenbergen, J., Augustinus, C. and Bennett, R., 2014a. Towards a design for a pro-poor land recordation system, Paper presented at the Annual World Bank Conference on Land and Poverty. Washington DC, 24–27 March 2014. Zevenbergen, J., Kerle, N. and Tuladhar, A., 2014b. Spatial information for addressing and assessing land issues in disaster risk management. Land Tenure Journal, Food and Agriculture Organization of the United Nations, 1, 9–35.